If we all had the right guidance, the requisite reference material at hand, and unlimited time to write and revise the essays that we write, quite a few of us would eventually be able to produce satisfactory essays. The same task becomes infinitely more difficult when it is presented in the form of the WAT, which must be accomplished in approximately 15 minutes, and which must be produced entirely from references in one’s memory. When we are ultimately faced with the final WAT assignment and a blank paper, several factors begin to weigh heavy on our minds. There is the complexity of the topics, the usual lack of enough practice in writing, the external pressure of the ticking of the clock, and the internal fear of ‘messing up and being eliminated’. Anyone of these is sufficient to distract you from the task at hand. When all four come together, most candidates have the same response: utter panic. What does the mind do when it panics? It resorts to a primordial choice: fight or flight. Most candidates will either abandon the effort altogether or jump headlong into it, which means they will furiously and thoughtlessly attack the paper with the pen in order to be done with the task as soon as possible and get out of the room. 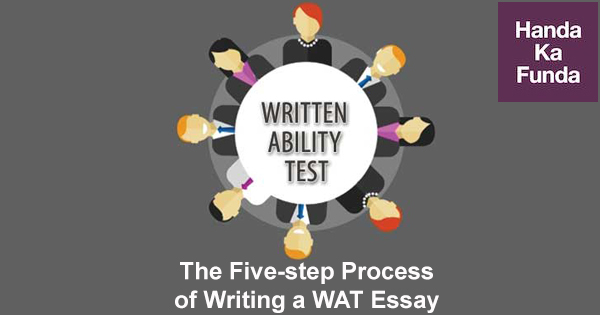 Most candidates begin their essay responses – both in practice essays and the final essays – with this fundamental mistake: starting to write the essay at once without any plan. This, in fact, the first test in the WAT assignment: are you a kind of individual who, in the face of a serious challenge, panics and breaks down, or are you the one who is able to keep calm, think logically, plan accordingly, and accomplish the task to the best of your abilities? In the words of the great Rudyard Kipling, if you can keep your head when all about you are losing theirs, you are the one the B-school is looking for. What are the pivotal factors in any plan? The objective: we need to write an essay that demonstrates clarity of thought, the simplicity of expression, comprehensiveness of perspective, and robustness of reasoning. The resources: This is a bit tricky as we have no access to any reference material. Therefore we must rely on our memory. If the topic is open to interpretation and offers the writer the freedom to choose a framework for discussion (e.g. any XAT essay), the task is somewhat easier. However, if it is a specific topic (such as ‘The 2016 Demonetisation in India’) then we must primarily rely on our a priori knowledge of the topic. For this reason, it is imperative that all WAT takers keep themselves updated on current affairs. The time available: Irrespective of how much time we have, we must divide it appropriately among the necessary steps, instead of devoting all of it to the act of writing. For the sake of understanding the process let us imagine that we have 20 minutes on hand. The first step in understanding the topic is to define the keywords of the topic, in a way similar to the definition of the topic that the group attempts to give in GD. The word ‘keyword’ implies that a sufficiently comprehensive definition of that word will ‘unlock’ the topic for us. Any relevant discussion – essay or GD – on the topic is impossible unless the definitions for the keywords exist. For example, let us take this year’s XAT essay topic: Globalization and Jingoism Always Coexist. Globalization – What does it mean to the writer? Jingoism – How does the writer wish to define jingoism? Coexist – is this a coexistence of harmony or disharmony? Many XAT takers with whom I interacted had no idea what ‘jingoism’ means. So they wrote an essay on ‘globalisation’. While it may be a better option than leaving the paper blank, it would be a largely irrelevant essay since the topic is only partly ‘unlocked’, and therefore the essay will fail to showcase the writer’s analytical ability, which is a most important parameter of evaluation. Every writer can define the above keywords in the context of their reading, experiences, observations, and interpretations. Each one of us has led a unique life, therefore each one of us can, potentially, write a unique essay. That is exactly what the essay should primarily do: reveal how you think. I encourage you to refer to the initial paragraphs of an essay I referred to in the previous post. The essay is “Why I Am Not a Christian” by Bertrand Russell. Observe the effort the writer has put into defining the word ‘Christian’. Time and again I have encountered a common question from all quarters of students: How should I begin the essay? Many WAT takers tend to begin their essays with something funny (or punny) which may have nothing to do with the topic. Some use famous quotations which, although memorable, make for a very predictable and therefore uninteresting beginning. Some even repeat the topic directly. Instead of resorting to such gimmicks, we could begin by simply defining the keywords of the topic, which gives the reader the first glimpse into our thought process. I consider Russell’s aforementioned essay to be the best essay I have ever read. It begins in the simplest way possible, yet the writer’s clarity and conviction radiate through the very first words. Here we divide the 3 minutes into 2 halves and devote each half to one side. We first think of all the arguments, ideas, observations, and experiences in favor of one side, write them down on one side of the ‘T’, and then repeat the process for the other. If done impartially, this exercise will give us an all-around view of the topic issue. No matter what side we eventually favor, we shall use the data on both sides to present a comprehensive understanding of the topic, along with the reasons why we favor one side over the other. This exercise is kind of ‘Google-searching’ our head for information. There need not be any particular order in which information turns up in the ‘T’. In the next step, we shall order it appropriately. In case of a descriptive topic, in which requires no position to be taken, you can replace the ‘T’ with simple bullet points. Here too, do not worry about the order. Just let the points come out. Once they are out, the clutter in our heads reduces, and we can think more clearly and confidently. The numbers next to rectangles represent the proposed order of your paragraphs. You may club the points together, or separate them as you feel appropriate. The point is, we must plan the paragraphs before we begin to write in order to maintain the coherence of ideas. Otherwise, the essay may seem disjointed and leave the reader befuddled. The concept of the rectangles can also be applied similarly to the bullet points you may have prepared for a descriptive essay. When you write the essay, stick to your plan. You may improvise the contents of the paragraphs, but it takes considerable experience in writing to be able to significantly alter the plan. Unless you have such experience, avoid deviating from the plan. Also, avoid the temptation of ‘saving’ the time on steps 1, 2, and 3 in order to increase the writing time. If we do not know what to write, we will end up wasting whatever time we give ourselves. In the next post, we shall look at step 4 in greater details. Leave a minute for checking your essay for the following issues: spelling mistake, punctuation errors, and vocabulary changes. DO NOT use this time to make major structural changes to the essay, as you will simply not be able to complete the task within the time limit, which will reflect poorly on your time management. You may even end up spoiling a good essay. Does this plan look simple? Maybe on paper. You must, however, practice it religiously prior to writing the final essays. Like all processes that the mind tries to learn, this plan must be practiced so often that it becomes a reflex response to the task. In other words, you must write 100 essays before you see any improvement!